The extract below is taken from Face to Face: British Self-Portraits in the Twentieth Century by Philip Vann (Sansom & Company, 2004). No surviving correspondence between Dorothy Mead and Ruth Borchard survives. However, in an undated letter some time in 1964, the painter and critic Andrew Forge (q.v.) refers to his forthcoming visit to Ruth in Reigate, and asks, 'May I bring a painter friend, Dorothy Mead, who expressed a great desire to see your collection as she had heard about it from other artists?' It thus seems quite likely that Ruth bought Mead's self-portrait in 1964, or soon after. Dorothy would have heard about Ruth's collection from Cliff Holden, whose own self-portrait Ruth had bought. 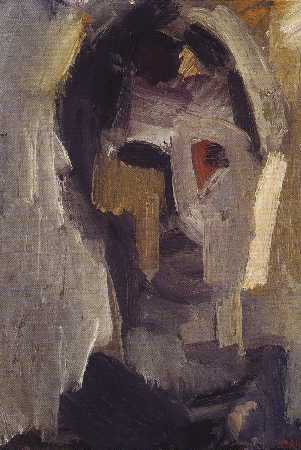 In the same year, Ruth also purchased self-portraits by Mario Dubsky and Dennis Creffield - both greatly influenced by Mead, herself a passionate disciple of David Bomberg. Born in London in 1928, Dorothy Mead was about thirty-two when she painted this self-portrait (signed 'D.Mead. 60' in red). Above a tall, slender, form neck, the head - which has features strongly yet delicately abstracted rather in the manner of a Benin mask or a Modigliani head - radiates gentle authority. Here is an upfront, sensitive, questioning presence without a hint of arrogance. The picture is composed of very broad bushstrokes of mostly understated colours with, here and there, a more vibrant frisson; a swathe of orange around her left eye, a purple patch above and at the top of her forehead. The brushstrokes seem freshly deliberated - around the bottom of the neck, for example, is a zigzagging grey brushstroke, its genesis still thrillingly clear to the eye. A vivid sense of overall structure (what Bomberg famously called 'the spirit in the mass') predominates. Dorothy Mead occupies a curious position in the history of modern British painting. When her paintings were shown as part of the 1991 exhibition 'Bomberg and his Legacy' at the Towner Art Gallery in Eastbourne, Sarah Rose wrote that during Mead's lifetime - despite her strong influence on other artists - 'dealers in London displayed no interest. She never had a one person show in England before her death in 1975.' And yet around the time that Ruth Borchard bought her self-portrait, Mead was being accorded some degree of official recognition as a gifted, radical youngish painter - for example she was one of '6 Young Painters' in the 1964 touring Arts Council exhibition of that name; fellow exhibitors were Peter Blake, William Crozier (q.v. ), David Hockney, Bridget Riley and Euan Uglow (q.v.). By the evidence of her self-portrait and other pictures such as a large 1961 oil painting of Flowers (now in the Arts Council Collection) - an exuberant bouquet evoked by broad brushstokes of pale, luminous colour interspersed with occasional deeper tones of purple and orange - Mead merits more serious attention as a painter. As Sarah Rose noted in 1991: 'Time is bringing deeper appreciation of Bomberg's art but there has been a surprising lack of curiousity about those who worked with him [excepting, as Rose notes, Frank Auerbach and Leon Kossoff]. and a consequent tragic neglect.' It is surely true that a continental equivalent to the 'School of Bomberg' would be accorded utmost critical and public respect, even a certain reverence. Bomberg's 'Legacy' - in the form of his many talented students like Mead, Creffield, Dubsky, Holden and Marr - has not yet been given its full due. Dorothy Mead first encountered David Bomberg when he was teaching temporarily at Dagenham School of Art in 1945. She followed him to the City Literary Institute in London, and then to the Borough Polytechnic, also in London (where she studied from 1945-51). As she later wrote, 'the Borough Group [of which she was a founding member] started in 1946... to further the aims of David Bomberg and to establish his students as professional painters.' There is a photograph (illustrated in the Introduction, page 21) of Dinora Mendelson, Leslie Marr (q.v. ), Dennis Creffield (q.v.) and Cliff Holden (q.v.) and Dorothy Mead herself - the latter three seen crouching, wide-eyed, at the foot of an easel in a studio - at the Borough Polytechnic, c.1948. It is possible that Bomberg's Borough classes would not have flourished at all, had it not been for the rather peculiar circumstances which schools and colleges were in at the end of the war, when Art departments were starting up again and looking for students... when there was still a large number of potential students away in the services. In this atmosphere Bomberg's first students acted somewhat as recruiting officers, enlisting likely people from all parts of London, and in this respect, Cliff Holden [whom Mead later married] saw himself as a natural leader, having what he now describes as a 'Messianic feeling about Bomberg'. [Bomberg] always said, 'try to remember the mood'; it was only by remembering the mood of the creative act that one could be certain of working well, and progressing from one vital image to another. It had to be an almost ecstatic drunken state, in which we project ourselves into reality, into things, rather like an actor becoming identified with the character he is playing. It was in a concern with mass that we strove to find the unique character of the mass and the meaning in the reality. Mead exhibited with the Borough Group until it disbanded in 1951, but she continued, as Buckman has noted, to do 'much to disseminate Bomberg's ideas in Britain and abroad, notably through her association with Andrew Forge [q.v.].' From 1958-9, she was President of the annual London exhibtion 'Young Contemporaries', and, two years before her death in 1975, became the first female President of the London Group. In 1976, the London Group held a retrospective 'Appreciation of her Work', which included Pieta (after Van Gogh), Portrait of Andrew Forge with obliterated self- portrait, Four Self-Portraits within one composition, two pictures entitled Self- Portrait, and Self-Portrait as Clown. Many thanks to Philip Vann for permission to reproduce this chapter here.